The Atlas Copco Air Filter Replacement - 1621-8432 features microglass media and galvanized steel frames. Equipped with a capacity of 2500 SCFM, the Atlas Copco Air Filter also includes a micron rating of 2 with -98.7% efficiency, making it suitable for rugged industrial construction. 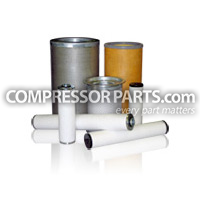 This filter element is an economical OEM compatible alternative for Atlas Copco 1621-8432.